I am sharing a part of my life here today that I have never shared with anyone because for me it is a scary time that I went thru and I still deal with it. it is Intimidation when going to the gym to work out. I would love nothing more then a gym membership and work out and be in shape like all the other friends I have, some days I feel like I am fat and the other people at the gym watch me and think to them selves, why is she here or she has a lot of working out to do. His co worker was teaching the class and the moves that he was teaching really scared me but I pushed thru and I made it, I went a few other times since that night, each time it would get easier and easier, it is ok to ask for help if you dont know how to use a machine, it is ok to strike up a conversation with the person on the treadmill beside you, I currently do not have a membership but I really think I may get one and in the new year use it. What about you, how do you feel with going to the gym? 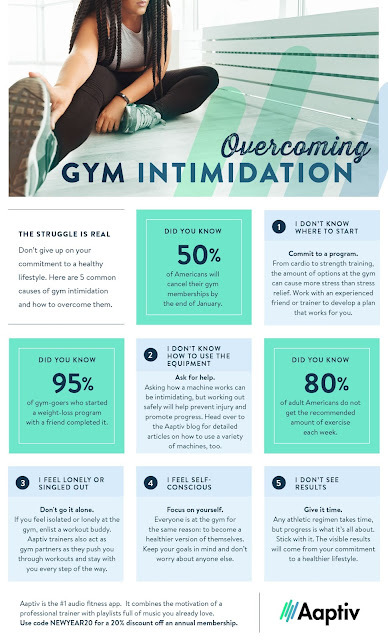 Check out some additional tips on overcoming gym related anxiety this New Year! Right over here .